Namibia is situated on the southwestern coast of Africa. It is a country of contrasting beauty and borders: Angola and Zambia towards the North, South Africa towards the South and Botswana to the East. Namibia is mainly a desert country and is approximately half the size of Alaska - 825,615 km2. For a country of this vast size it only has a population density of about 2 people per square kilometer. 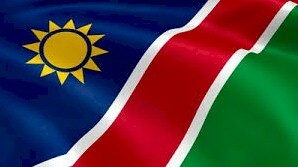 Namibia is a culturally diverse country and have 11 indigenous languages. Besides that fact that Namibia has on average 300 days of sunshine per year, it is also a country rich in diamonds, minerals and wildlife. 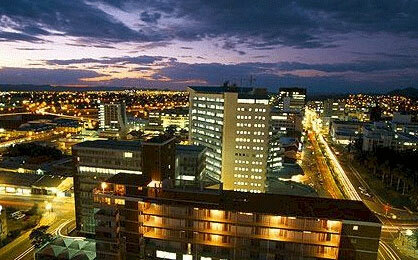 The capital city of Namibia is Windhoek, situated in the center of the country. No where else is unity in diversity seen, with equal parts traditional heritage and modern emerging identity, than in Windhoek. 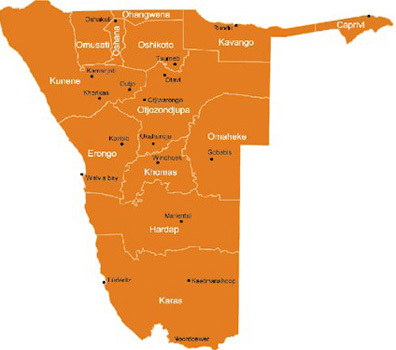 The Hosea Kutako International Airport (40km from the city center) is easily accessible from all over the world with major airlines operating regular flights to- and from- the capital city. The Namibian economy is closely linked to that of neighboring South Africa with the exchange rate between the Namibian Dollar and the South African Rand being 1:1. Overall, the economy is highly dependent on the mining and processing of ores and minerals, which is mainly exported all over the world. Rich diamond deposits make Namibia a primary source for these highly sought after gems. Visitors to Namibian can expect to eat a lot of MEAT. The agricultural sector and especially cattle farming is the second largest contributor to the economy. The agricultural sector has seen more diversification over the past years. Namibia is well-know for its safe and friendly atmosphere which makes it an ideal travel destination. 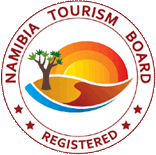 It is thus no surprise that tourism contributes a whopping 14.5% to the Namibian economy. It is also one of the fastest developing sectors of the economy as the private and public sectors are expanding their services to accommodate the influx of visitors. Although the economy has seen a slight downward growth during 2016 and 2017, economists are optimistic that the economic growth will steadily improve throughout 2018 and 2019. Visitors to Namibia will undoubtedly visit one or more of the National Parks and Protected Reserves. Namibia boasts 20 protected and state managed national reserves ensuring that the country`s abundant wildlife remain one of the its greatest assets. These protected reserves cover approximately 17% of the land surface area for which Namibia has gained international recognition. The most famous of Namibia`s national reserves is the spectacular Etosha National Park which is home to 114 different mammal species. Etosha`s name translates as Great White Place or Dry Water. The wildlife is typical of the southern savannah plains in Africa with large herds of game such as Springbok, Burchell`s Zebra, Oryx and Blue Wildebeest, as well as smaller numbers of Red Hartebeest and Mountain Zebra. It`s also home to Lion, Cheetah and the elusive Leopard. Some 300 Black Rhino live in the Etosha Park. It also has a large Elephant population that fluctuates between 750 -1500 as they migrate between Kaokoveld, Etosha and the Caprivi Strip. Visitors will surely be treated to a diverse range of Namibian wildlife. The Namib Desert is one of the country`s most breathtaking and unique habitats. The word Namib is a indigenous Nama-word meaning the vast place which accurately describes this 55-million year old desert that stretches over 2,000km and receives only about 2mm of rainfall per year. A visit to Namibia will not be complete if you have not personally experienced and seen the copper-coloured shifting sand dunes meeting the cold Atlantic Ocean. Waterberg Plateau was proclaimed a protected, National Park in 1972. The striking feature of the Waterberg National Park is it large, flat table-like mountain top. The mountain range is not easily accessible which is allowed for the relocation of endangered species. The White Rhino was reintroduced from South Africa. One of the famous and best established coastal towns, is Swakopmund and is a beehive of tourist activity. This town is situated in the Namib Desert and is filled with German colonial architecture. A 30-minute drive from Swakopmund will bring you to the harbor and industrial town of Walvis Bay. The Walvis Bay Harbor is undergoing extensive expansion and development to accommodate the influx of vessels importing - and exporting - goods from and to Namibia. Cape Cross is National Seal Reserve which covers 60sqkm and is approximately 120km north of Swakopmund. It is home to one of the largest colonies of Cape fur seals in the world. The seal population numbers fluctuate between 80,000 and 100,000 with only one in four seal pups surviving as they often fall prey to jackals and hyena. It is truly a remarkable place to visit and to come close to these Cape fur seals as far as the eye can see.